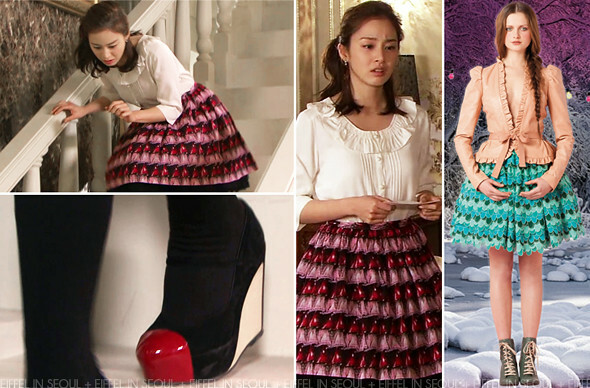 In episode 11 of MBC drama, My Princess, actress Kim Tae Hee (김태희) wore a skirt from Manoush Fall/Winter 2011 collection as well as a Love Moschino boots. The same boots was worn by Miss A's Fei in their editorial with Elle Girl. I love the boots and the skirt but I'm not loving the entire look. What do you think? according to interviews, kim tae hee put together most of her outfits in the drama as she has a degree in fashion design. the skirt looks great and the shoes too but her top is really baggy and detracts from the appeal of the rest of the outfit. i dunno...>,< i didn't like a lot of her outfit combinations. maybe we just don't have the same style tastes.